What follows are special images of minor planets or asteroids and some stories of discovery and special observations. All of the Sunflower observations were made using the remote controlled LX200 10" telescope and ST7 CCD camera in the Sunflower Observatory in Olathe, Kansas. On the evening of July 14, 1999 I downloaded the orbital elements for a freshly discovered Near Earth Asteroid that had been reported from the night before by LINEAR. The object had not recieved a designation, but the movement was very fast. It appeared to be moving at about 22" per minute almost due north. I used the Sunflower Observatory 739 to find it and called out to Powell Observatory 649 and talked to John Anderson and Nick Reuss who had their TEAM C at the control center. I guided them to the proper field and they also acquired the object. The animation shown is a composite of three images taken by this team at Powell. 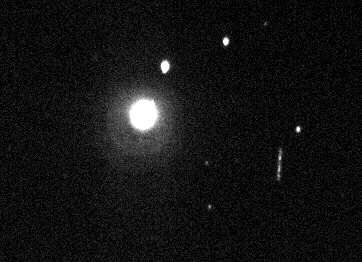 On Saturday night April 10, 1999 Gordon Garradd from Australia and were chatting on #sciastro and he mentioned that LINEAR had just discovered a very fast moving object passing by the Earth. It was designated C05352. LINEAR's initial discovery observations were all that was known and it was very bright, about mag 13, so it might be worth tracking it down and seeing if I could get some observations to report. 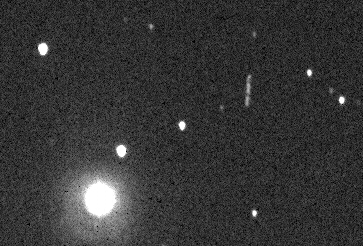 I immediately started looking for it using the ephimerides from the NEO page and on my fifth 60 second image a bright streak was very obvious. I imaged the asteroid from 05:45 UT until 8:24 UT APril 11, 1999. It was very obvious even in 5 second exposures. The image shown above is a combination of four 60 second exposures taken one right after another with about one minute between the end of one and the start of the next one. Except the last exposure to the upper left was taken two minutes after the last one. North is up and east os left in this image and the onject is moving from the southwest to the northeast and is in the eastern side of Bootes during this series of images. It seems amazing that something this bright and fast was not detected sooner than it was. It has already blown past the Earth and is receeding from us. I will look forward to seeing how close it came as soon as my observations are added to those of others and a better orbit calculated. It is exciting to make contributions like this. 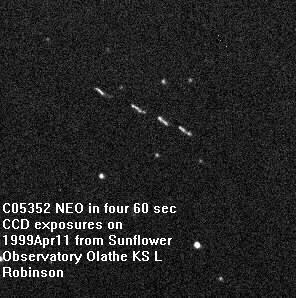 These are two ten minute exposures of the Near Earth Asteroid 1999CV3. The purpose of making the first image was to show the fast movement of the asteroid. North is up and east is left and the asteroid is moving north. After processing, it became obvious that the image had also captured some periodic brightening and dimming characteristic of a tumbling object. My much more experienced friends think this brightning and dimming may be due to the periodic error in my dec tracking since the elongation of the stars is in the same direction. The second exposure was to confirm the tumbling effect and indeed it does show the same effect and also the elongated stars. The location during this exposure is near mag 6.8 star SAO 27434 in Ursa Major. This is just about a half degree east of 30-Phi Ursae Majoris. The first image was taken at start time of 5h 25m 11s UT on MArch 3, 1999. The second image was started at 6h 17m 11s UT on MArch 3, 1999. Gordon Garradd said he was getting constant magnitudes when he imaged it earlier this year, so the variation is probably just dec periodic error. This means I need to improve my polar alignment! Here is a two shot animation of 1999BJ8 taken from Brevard Observatory in Cocoa Beach, Florida (left) and Sunflower Observatory in Olathe, Kansas (right) at about the same time on February 13, 1999. It demonstrates the effects of parallax on this near by fast moving asteroid. Note how the paths of the asteroid between the two locations appears shifted north to south between the two locations. In these images north is up and east is left.